This condition — called body dysmorphic disorder — affects about 2 percent of people, research shows. 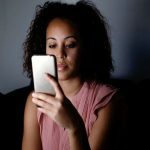 “A new phenomenon called ‘Snapchat dysmorphia’ has popped up, where patients are seeking out surgery to help them appear like the filtered versions of themselves,” said the new report’s co-author, Dr. Neelam Vashi. She’s director of the Ethnic Skin Center at Boston Medical Center and Boston University School of Medicine. The U.S. Office on Women’s Health has more about body image.